Dollar Energy Fund is halfway through a successful 2018-2019 program year. Take a look at what we have accomplished during the past six months, with the help of our staff, utility partners and supporters. In November, the 10th annual Warm Your Hearth, Touch a Heart Campaign kicked off with a reception at Hearth and Home Furnishings in Zelienople. Efforts to date have brought our ten-year total to more than $160,000, including a generous match from Peoples, to assist gas customers throughout Butler County. Dollar Energy Fund was the presenting sponsor and benefiting charity of Shadrack’s Christmas Wonderland for the second year in a row. Shadrack’s made a generous donation of $20,000 to Dollar Energy Fund. Through a partnershp with Chick-fil-A, coupons were distributed to customers to receive $2 off admission. Dollar Energy Fund received $1 donation for every coupon redeemed. These efforts resulted in utility assistance for 115 local families. Dollar Energy Fund hosted its 2nd annual Winter Warm Up Request-A-Thon at iHeartMedia studios and broadcasted on 3WS Pittsburgh. The event raised $93,872 to provide utility assistance to approximately 260 Pittsburgh families who were struggling to stay warm. Duquesne Light Company supported Dollar Energy Fund during its Power It Forward campaign through a ’12 days of giving’ fundraiser and text-to-give campaign for Pittsburghers in need. Dollar Energy Fund participated in #GiveBigPittsburgh, an online giving day hosted by the Pittsburgh Magazine on Giving Tuesday. Columbia Gas of Pennsylvania and Dollar Energy Fund teamed up to host our first ever Topgolf Fundraiser in November. The event raised $12,210, including a dollar-for-dollar match by Columbia, to benefit customers in need. This amount provided much-needed heating assistance to approximately 35 households this winter. In December, Columbia Gas of Pennsylvania hosted a fundraiser in partnership with the Trans-Siberian Orchestra. A portion of every Pittsburgh ticket sold was donated to Dollar Energy Fund, totaling more than $11,200. Dollar Energy Fund received notification from the McCune Foundation that our organization was awarded $250,000 in grant funding to support the preliminary planning of the Utility Scale Solar Generation Facility. 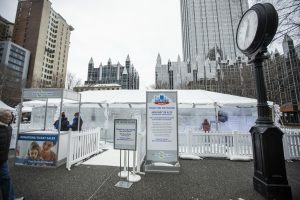 In January, Dollar Energy Fund raised more than $156,000 during its 5th annual Cool Down for Warmth event in Market Square. The amount raised gave assistance to approximately 450 Pittsburgh families and individuals who were struggling to afford safe utility service. During Cool Down for Warmth, we hosted our 3rd annual Bowls for Warmth Soup Tasting, presented by BNY Mellon. Twenty-one local restaurants showed up to support Dollar Energy Fund and serve cups of soup to the lunchtime crowd. Bowls for Warmth raised over $10,000 in two days, including a match from our utility partners. 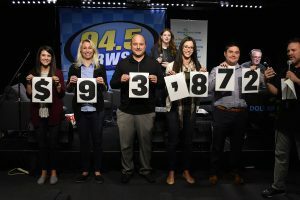 In February, Dollar Energy Fund’s 11th annual Warmathon on NewsRadio 1020 KDKA raised $155,000, which provided utility assistance grants to 430 Pittsburgh-area households. Through our partnership with the Pittsburgh Penguins, we hosted a variety of fundraisers this season to expand our reach and awareness in the community. Our Jerseys for Warmth Auction raised more than $53,000 to benefit Peoples Natural Gas customers in need. In March, our Fan Appreciation Night Raffle raised nearly $8,000, including a match from our utility partners. This year, Dollar Energy Fund started contracts with many new utility partners. We now administer programs for Pacific Gas & Electric, West View Water Authority, and Maryland American Water. Most importantly, Dollar Energy Fund has distributed over 10,700 grants, totaling more than $3 million across the country since October 1, 2018. With your help, we can continue to provide immediate and direct assistance during our 2018-2019 program year. Your contribution, no matter how big or small, can make an extraordinary impact by ensuring local, limited-income families maintain or restore safe utility service and get on a path to self-sufficiency. If you would like to get involved during this program year, subscribe to our email newsletters to stay up-to-date on our latest fundraising campaigns. We have many more fundraising opportunities coming up this summer, including our Fishing for a Cause tournament and Golf Classic. On behalf of the many individuals, seniors and families we’ve helped, we thank you for your continued support!